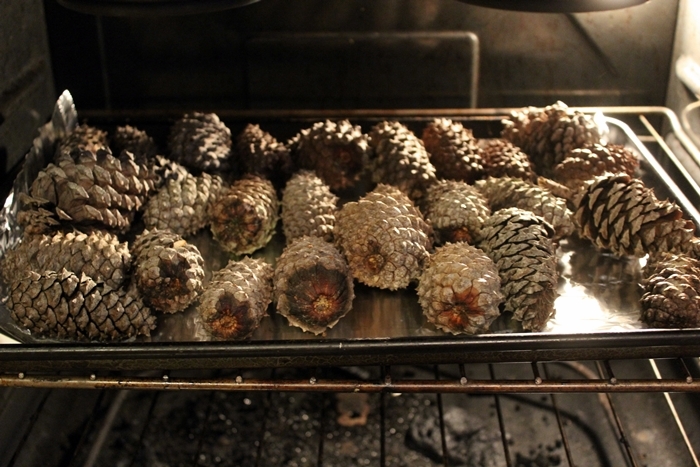 Once you have gathered all your pine cones its time to put them in the oven! This helps to crisp them up as well as bake out any bugs still living in them. Arrange your pine cones on a baking tray lined with foil and Bake at Gas mark 5/200 degrees for 20 minutes. Get ready for the warm spicy scent of pine to fill your kitchen as they get toasty in the oven. Gorgeous! This pine cone is one of my favourites because it looks so unusual and beautiful. Almost like a cinnamon pastry! Its scent was also sweeter smelling compared to the other Long & Shortleaf pines in my haul. It is from the Atlas Cedar tree and although very popular here in Britain, they also appear to be a delicacy for woodland critters (squirrels?) so this was the only intact one we could find. The rest had been greedily munched on, like apples. 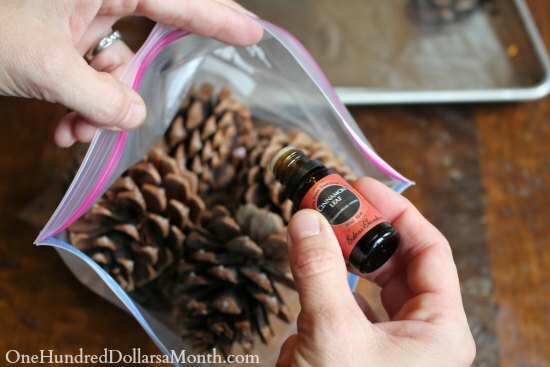 Place a handful of pine cones into a ziplock bag, sprinkle a few drops of your chosen essential oil (I love Cinnamon), give the bag a shake to mix things up. Then leave them to infuse in the bag for between 1 – 7 days depending on how intensely you want them to smell. Repeat and top up with more oil if needed. This entry was posted in How - To and tagged Autumn, Decor, Fall, tutorial. Bookmark the permalink.